Social media has ushered in an era in which words cannot be unsaid. Whilst in the days before the internet you could say things in private that had a relatively short lifespan, the internet age has immortalised our words for all to see. And while for many this just means we're crippled with embarrassment by our teen statuses about shopping and being at sleepovers with friends, for celebrities it can be career-ending. Both youtube vlogger Zoella Sugg and Gay Times editor Josh Rivers have been forced to apologise this week for a number of their hugely offensive old tweets. It's already been a bad week for 27 year old youtuber Zoella, as fans were outraged over the price of her 12 day advent calendar. The star released an advent calendar priced at £50, despite its cheap contents only being worth around £21, inundating her with criticisms that she was exploiting young fans. Zoella's week only went from bad to worse, as her critics began to delve a bit deeper in their quest to expose the vlogger's other less-than-perfect side. As a result, a number of Zoella's hugely insensitive (and now deleted) tweets began circulating Twitter under the hashtag #ZoellaIsOverParty. The tweets included homophobic, classist and sizeist slurs. The tweets, though written between 5 and 7 years ago, were typed by a 20 year old Zoella. They include numerous derogatory uses of the word fat, a number of snobbish tweets targeted at those clearly less well off than her incredibly privileged self, and many uses of misogynistic language. Many defenders of the vlogger and entrepreneur have pointed to the dates of the tweets, which were mostly written between 2010-2012. However, Zoella was still between the ages of 20-23, an age at which you categorically know that homophobia and other such slurs are not acceptable in private, let alone publicly on social media. In similar fashion, recently appointed Gay Times editor Josh Rivers has been found in equally hot water as his old racist, homophobic and classist tweets began to emerge on Twitter, as well. 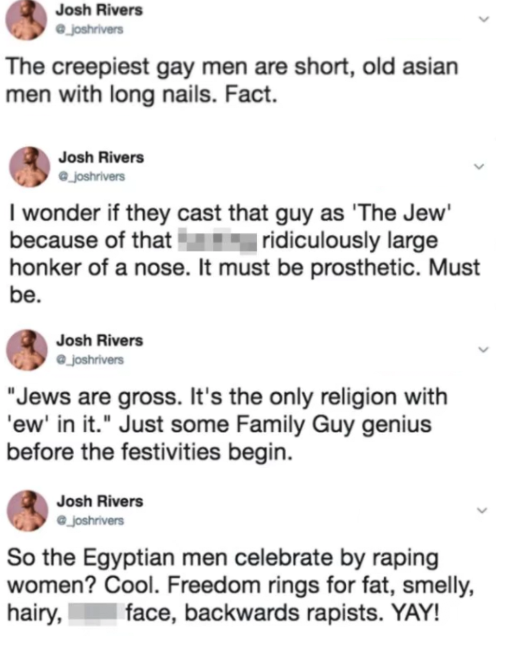 Rivers' tweets, which were written mostly between 2010 and 2011, include racist remarks against Africans and Asians, as well as anti-semitic comments against Judaism. Rivers has since been suspended from his role of editor at Gay Times, the oldest publication for gay men. The Gay Times have launched a formal investigation, stating it will take appropriate action. Both celebrities have since issued apologies. However, many are less than satisfied. Zoella's tweets fell into the classic 'I'm only human/ not perfect' non-apology... 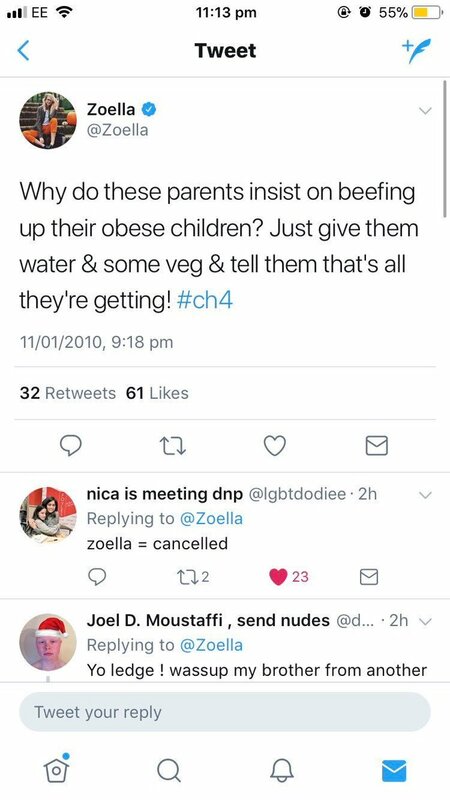 Sorry Zoella, you don't have to be 'perfect' to know that these tweets were insensitive af. She topped this off with 'I'm sorry IF I offended anyone'... the operative 'if' making her apology utterly redundant. You did offend people, Zoella, and you should apologise as such. At the time of writing, Gay Times released a statement that Rivers' tweets were not in line with their beliefs, announcing that his employment has been terminated, only a month after he began in the role. All of his articles have been removed from the publication. It just goes to show: everything you say is eternalised on social media. So if you wouldn't say it out loud, or to someone's face, then don't post it online.